There are seminal moments in every band’s career and March 9 was one for Norwegian hip hop and rap band Karpe Diem. 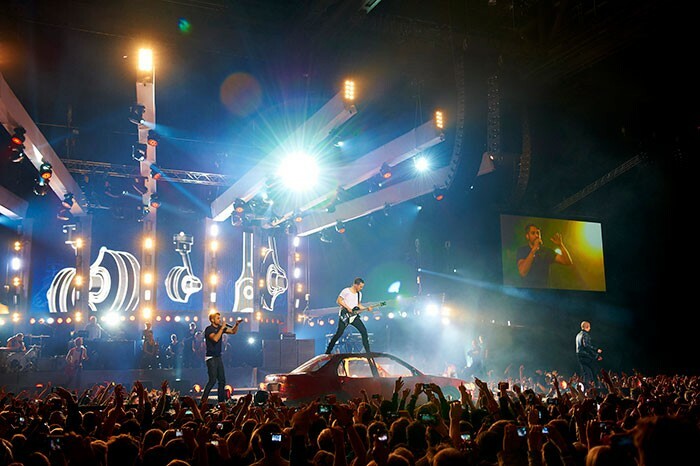 Playing to a packed house at Oslo’s Spektrum Arena, Karpe Diem delivered a memorable show beneath a large Martin rig that included some of Martin’s newest lighting solutions. Playing before their largest audience to date, the show was universally acclaimed as a huge success for the band, and was also a benchmark for lighting designer Sebastian Ekeberg, who has been with Karpe Diem for the last four years. "This was one of the largest and most important events I’ve been involved in so when I designed the show it was important for me to use equipment I knew in advance," Sebastian stated, who turned to a large Martin rig that included some 225 MAC moving heads. "I’ve had great experience with the MAC range in the past so they were an obvious choice for this show." Sebastian’s design was both innovative and inspiring. His mixture of LED and HID sources coupled with LED video screens and creative LED video elements, with a dash of smoke effects, pyrotechnics and C02, was pure visual pleasure and complemented the performance to a tee. At his disposal were a host of MAC Aura, MAC 101 and MAC 401 Dual LED fixtures along with MAC 2000 and MAC 700 series moving heads. Sebastian also turned to Martin’s new MAC Viper Family in the form of the award-winning MAC Viper Profile. "When I started planning this concert, the MAC Viper Profile was brand new on the market. I got to see a demo at the Prolight + Sound show in Frankfurt in 2012 and quickly became a fan. I was really hoping that Norwegian rental companies would also like what they saw so I could put it on the rider and lucky for me the Viper quickly became an industry standard in Norway." Sebastian spread Viper Profiles across six finger trusses fanned over the stage, alternating them with MAC 401s. He also lined Viper Profiles beneath upstage LED screens with more Vipers working from a side truss and floor position each side of the stage. The MAC Viper Profile wasn’t the only new Martin moving head in the rig however. 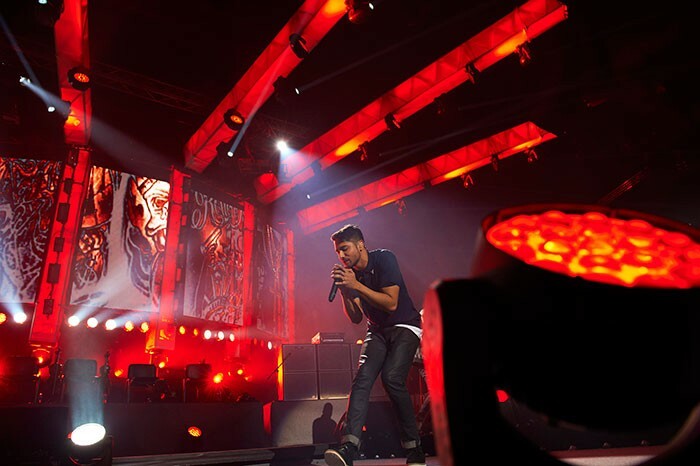 "With so many Vipers and LED screens in the design, I needed an even more powerful lamp that could function as a wash and a beam," Sebastian said. "I had never tried the MAC III AirFX before but it impressed me a lot. Previously, where I’ve chosen both a beam and a powerful wash, I can now get both functions from a single luminaire. It’s a powerful lamp with a lot of possibilities." Mounted on a moveable truss and positioned beneath the LED screens or above the finger trusses, the 1500-watt MAC III AirFX moving heads were powerful enough to also shoot effects through the screens. Super bright at nearly 60,000 lumens, it is a new concept that combines hard-edge, mid-air effects and a wash field in one luminaire. To underline the importance of the evening, the show was broadcast by Norwegian television and the show will also appear on an upcoming DVD by the band. Sebastian’s mix of visual elements was pure delight on camera. "When it was decided that the concert was going to be filmed for TV and DVD, I wanted some extra lights as camera candy," he says. "I was lucky to try out the new VC-Dots and used them to outline the stage. When I now look at the pictures of the concert, I am really happy with this solution." Sebastian lined the main A stage and B stage with some 448 VC-Dot 4s (7 strings altogether), Martin’s new lightweight string of individually controllable, bright Dots. Available in RGB or white light versions, the colour-changing Dots integrated into the stage design not only helped to define the stage but added a professional touch to the look both on camera and off. And for the first time in Karpe Diem's history, video screens were implemented as a part of the design. Five vertical upstage screens - each screen 1.92 metres x 5 metres – consisted of a total of 100 Martin EC-20 LED video panels. "It was important to the band and me that the screens were used in a way that didn't take too much attention away from what was happening on stage," Sebastian says. "Jan Martin Vågen from BVLK solved this very well. He designed custom video content and mixed it neatly together with live pictures during the show." Since the show was not part of a tour, but a "one off," they were dependent on close co-operation with the technical supplier to find good custom-designed solutions, Sebastian says. The Oslo-based rental company Bary AS delivered the entire production - light, sound and video. Karpe Diem was reportedly very happy with the collaboration. Sebastian was very satisfied with the show as well and accolades came in droves, also from the press. "It was really fun to do this show, he says, "and great to wake up Sunday morning to fantastic reviews in Norway’s biggest newspapers."